Coenzyme Q10 or CoQ10 is a vitamin that is found naturally in our body. This vitamin acts as an antioxidant to protect cells from oxidation. Why is this important to you? When oxidation occurs, cells become damaged. When skin cells are damaged, skin becomes discoloured and starts to show wrinkles, sagging and other signs of aging. Not to completely scare you, but because our body’s ability to produce CoQ10 and other antioxidants tends to decline from aging and stress, the effects of oxidation become even more visible as we get older. The good news is that incorporating CoQ10 into your skincare will help your skin fight the effects of oxidation! Why use products with CoQ10? Although CoQ10 can be supplemented through diet or oral vitamins, skin is the last organ to receive ingested nutrients. To ensure your skin has enough antioxidants to reduce sun damage and even skin tone, it is best to incorporate CoQ10 into your daily skincare routine (morning and night). In addition to acting as an antioxidant, CoQ10 has many other benefits that keep skin looking youthful and glowing. CoQ10 boosts hydration, stimulates the production of collagen and elastin, and reduces collagen breakdown. Collagen and elastin are proteins that are responsible for skin strength and elasticity. More collagen and elastin = younger looking skin. Enough said. We have created a special Q10 booster specifically designed to fight oxidative stress caused by free-radicals, while also providing your skin with a youthful glow. 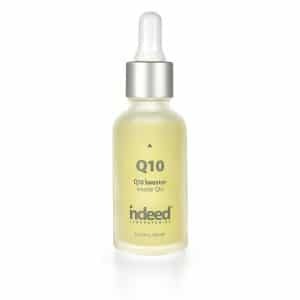 Not only does our Q10 booster minimize the appearance of fine lines and wrinkles, but it also helps protect the skin from free-radical damage and leaves your skin looking healthier than ever. Just apply two to three drops directly to your skin or mixed with a serum, moisturiser or liquid foundation every morning and night to receive an amazing anti-aging boost! CoQ10 and retinol may just be the ultimate anti-aging duo. Like CoQ10, retinol also works to prevent oxidative damage from free-radicals. So why use both? Retinol helps to breakdown fat-soluble CoQ10, which means that it will be absorbed into skin faster. Additionally, while CoQ10 and retinol are both antioxidants, they use different mechanisms to both target age-related skin concerns (uneven skin tone, loss of skin firmness, etc.). A note of caution to our customers with vitiligo: Several studies have shown that Coenzyme Q10 can block tyrosinase, the enzyme responsible for creating pigment. This means that products containing CoQ10 may worsen vitiligo symptoms. We recommend patch testing products before applying them to your face.